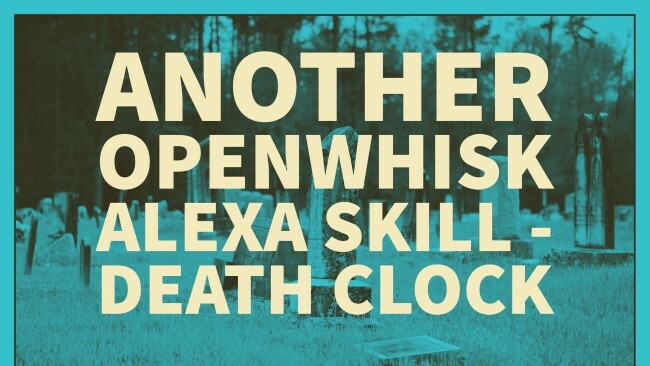 Earlier this week I had my second Alexa skill released, the Unofficial Death Clock. Like most things, this was a silly demo that became interesting the more I worked on it. I thought I’d share the code and the issues I ran into building it, but as always, I’ll warn folks I’m still new to Alexa skills, so I probably (most likely) didn’t do this the best way. As a quick aside, I built the original Death Clock many, many, many years ago as just a fun toy. I sold the site probably close to 15 years ago or so and haven’t really thought about it much. That being said, I thought it would be a fun skill to build. I ask Alexa when I’m going to die. On answering, I take that date, figure out how much time you have left to live based on an average life span, and then tell your estimated day of death as well as how many seconds you have left to live. Now - if you’re reading this and shaking your head about how inaccurate this is… great. You’re absolutely right. I’d get letters about this every week when I ran the site. It’s a joke, that’s it. Alright - with that out of the way - let me demonstrate the first version of the skill. This version does not actually support a conversation (and that turned out to be more difficult than I thought). Instead it simply supported a default greeting, and if you said a date value, it supported returning the ‘death’ info. This worked, but was not a conversation. In other words, I couldn’t say, “Ask Death Clock when will I die” and then immediately respond with my birthday after it asked for it. Note that I had to include an outputSpeech and a reprompt in order for it to work. I’m 99% sure I’ve got that wrong since I’m basically repeating the same text value twice. That being said, when I made this change, I could visibly see the Alexa device wait for my response. (Basically, the light stayed on.) I could answer with just the date and then it would work. Cool! So I went to verify it and then ran into some interesting issues. First, Amazon reported that there was a trademark on Death Clock. Fair enough - I sold it. I literally had to rename my skill to the “unofficial Death Clock” and that was enough. Cool. Your skill's descriptions do not clearly state the skill is a prank skill. We provide our customers with a trusted environment. Please update your skill to edit the description to comply with our content guidelines, and resubmit your skill for reconsideration. Ok, Amazon, I get it. We don’t want to scare people, but… fine. So I made that change too. The more difficult problems though involved the fact that my app didn’t support a “Stop” and “Cancel” event. I guess since my first skill was ‘one step’ this wasn’t necessary. And then I added code to handle these events and return a simple “Bye” message. Here is the complete version of the final skill. And that’s that. Here it is in action. Forgive the pause on “Death Clock”, I have a bit of a stammer with “D” words so it’s a struggle sometimes to say those words.